The pain that I live with now immediately flared up ~ the wet suit got tighter. Every Wednesday morning Tom makes soldiers for breakfast ~ it is a family tradition. A soft boiled egg that is made to perfection and buttered toast cut into strips for dipping. The strips or “soliders” sit on the plate around the egg which is held into position by an egg cup, or in our house a shot glass. These “egg cups” have been collected from all over ~ we make it a point to get one from every place we travel. Everyone in our house has their favorites…Tom usually gives me Anna’s and he uses Abigail’s favorite. I would try to take over this job of making soldiers but Abigail and Anna wouldn’t let me. “Tom does it best,” they would declare as I tried to cut the top off the egg without cracking the entire shell. They would yell for him saying that I was going to ruin it again. I smile thinking about the look on Anna’s face and how little confidence she had in my soldier making skills. The shock I experienced after the girls went to Heaven is no longer present. I am now fully feeling what it means to not have my girls with me. I think the shock protected me from the immense pain that one feels when dealing with this type of loss. I think the shock and keeping myself busy allowed me to not feel the pain to the fullest ~ not to go deep into my sorrow. I know full well that I have only scratched the surface of my grief and what it means to live this life without Anna and Abigail. I try to keep them very present in my mind and I know our love connects us and always will, but the longing I have to be with them is overwhelming at times. I look forward to going Home and being with them ~ I can’t wait till that day comes. I have no doubt that God is with me, holding me and protecting me through my suffering ~ I feel Him and see how He is protecting my heart ~ giving me peace when I need it most. With that said though, I am scared of the deep sorrow I know is coming. I don’t want to live this life without my girls, but I have to. I don’t want to eat soldiers another Wednesday without them, but I have to. The toaster’s home is on the other side of the counter. 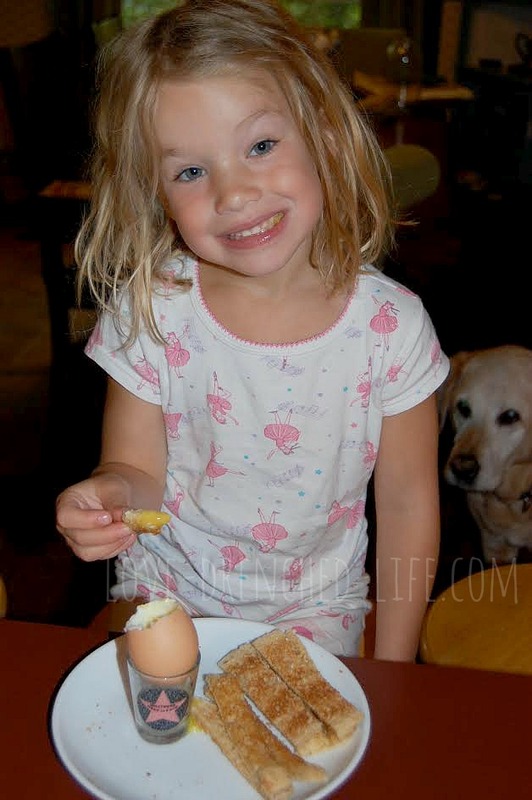 Anna would sit eating her soldiers at “Mama’s Cafe”, dipping them into her perfectly cut egg, and we would ask for her to put away the toaster. I wish I could give you a great big hug this very minute and cry with you. I am grieving for you, and will be praying right now. Love you friend.